Taking an active role in managing the finances of your practice is key to building a successful law practice. Foresight, active planning, appropriate internal controls, and an ongoing review of current finances are critical if your practice is to be successful and profitable. 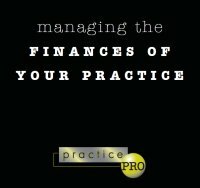 This booklet (Download PDF) reviews the steps you can take to better manage the finances of your practice, and touches briefly on some of the longer-term financial planning issues involved in winding up a law practice.